You can Ritual Summon this card with “Chaos Form”. Must be Ritual Summoned. Your opponent cannot target this card with card effects, also it cannot be destroyed by your opponent’s card effects. If this card was Ritual Summoned using “Blue-Eyes White Dragon”, when it declares an attack: You can change the battle positions of as many monsters your opponent controls as possible, and if you do, the ATK/DEF of those changed monsters become 0, also, this turn, if this card attacks a Defense Position monster, inflict piercing battle damage. We will be dedicating this whole next month towards the Legendary Duelists 3 set, and I was asked to pick the cards for the month since I pitched the idea and Bill will be away towards the later half of the month, so this will help him out some. To start off the month with a bang is the newest Ritual for Blue-Eyes, Blue-Eyes Chaos Dragon. Chaos Dragon is a Level 8 DARK Dragon Ritual with 3000 ATK and 0 DEF. 3000 ATK is great, but 0 DEF is bleh. Level 8 is an easy Ritual to make in Blue-Eyes, DARK and Dragon make for a great combination. You can Ritual Summon this with Chaos Form, since that seems to be the recommended Ritual Spell for this, but Advanced Ritual Art does the trick as well. Chaos Dragon must be Ritual Summoned, no reviving it after it dies. Your opponent cannot target this card with card effects or destroy it with card effects, which is great protection to have overall. If this card was Ritual Summoned using Blue-Eyes White Dragon, when it declares an attack, you can change the battle position of as many monsters your opponent controls as possible (since Link Monsters cannot exist in DEF Mode) and if you do, their ATK and DEF become 0 also this turn Chaos Dragon gains the piercing ability. Having to exactly use Blue-Eyes White Dragon might sound bad, but it is easy for the deck to get to it if you’re using Chaos Form or you can just use it from the deck with Advanced Ritual Art. The debuff on all monsters your opponent controls that changed their positions to 0 is permanent, and that is great for getting in massive damage, something Blue-Eyes loves to do, also getting access to piercing is nice, just wish it was double piercing like Chaos MAX Dragon, but oh well since if you get this and Chaos MAX out at the same time and switch something to Defense Position, Chaos MAX can one-shot your opponent more than likely and if it couldn’t with 8000 damage, Chaos Dragon is giving you an extra 3000. 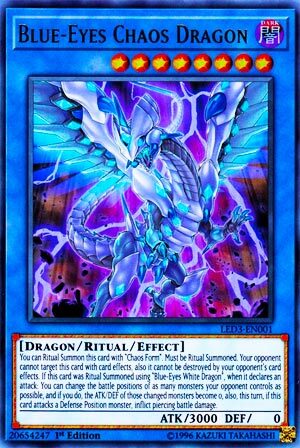 Chaos Dragon is a great ritual for Blue-Eyes alongside Chaos MAX and it is worth creating a Blue-Eyes Ritual variant with the Impcantation monsters as it could do some crazy damage. Art: 4.5/5 Much more clean and beautiful than Chaos MAX in my opinion. This is going to be a fun week folks! Blue-Eyes Chaos Dragon (a ritual card, on a Monday?) has some familiar stats, as you may notice. Level 8, Dragon, 3000 attack…but differs from the Blue Eyes original Dragon by being Dark and having 0 defense (as well as being a Ritual). Trade In is an option, which is good, and as far as Rituals go, this guy makes you want to play him, at least in my mind. Chaos Form brings this guy out (as well as more, you likely know this) and this card is immune to destruction from your opponent’s card effects, and can’t be targeted by them either. Which is very important, especially if you’re going to be investing in a Ritual card. If you used BEWD for this Ritual Summon (which would be logical enough) you can switch the position of all your opponent’s Monsters, and make their attack and defense 0. Wowzers. So that’s a built in, one sided, Zero Gravity, and to top it off, this Dragon has Trample built in too. So you could be doing a TREMENDOUS amount of Damage. With the 3000 attack, you’ll be doing Damage if you’re attacking attack position Monsters, and the bonus Trample also means you’ll be doing plenty of Damage too. This card certainly is powerful and unwieldy, and even has some OTK potential. Happy Monday! Blue-Eyes Chaos Dragon starts the week with its stats of Level 8 Dark Dragon-type Ritual Monster with 3000 Atk and 0 Def. Those are great stats. I like that Chaos from a Light Monster makes this and Chaos Max Dark Monsters. Anyway, use Chaos Form or Advanced Ritual Art to Ritual Summon this properly and you get a huge beat stick that is immune to targeting or destruction effects. If Blue-Eyes White Dragon was a tribute for the Ritual Summon, you can change battle positions of all your opponent’s monsters and make their Atk and Def 0. Then Blue-Eyes Chaos Dragon gains the piercing effect. No double piercing like Chaos Max, but on its own, BECD can do 3000 Damage to pretty much any monster. Otks become possible with this and the stats lend itself to good draw cards like Trade-In and Allure of Darkness. The only downside is the Def and the fact that you need BEWD to gain the trample effect. I look forward to this being a new BEWD Chaos archetype. Previous articleYu-Gi-Oh! TCG at NY Comic Con – Exclusive Playmat & more!